P.W. Joyce, interprets this name as Ir. 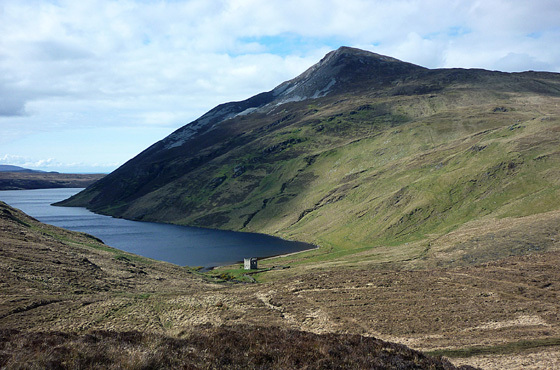 eachla or eachlann, 'stable', suggesting it is an example of a mountain named after a feature situated at its foot. However, Patrick McKay prefers to see the modern form as a re-interpretation of the original name Achla, a form of Aichill, meaning 'a look-out point or prospect' (Dictionary of Ulster Place-Names). Achill Island in Mayo (Ir. Acaill) may well be derived from the same root. Aghla More is the 333rd highest place in Ireland. Picture from group : View from the south of Altan Lough, Altan Tower and Agla More. Picture: View from the south of Altan Lough, Altan Tower and Agla More. A majestic viewing platform for the Donegal Highlands.